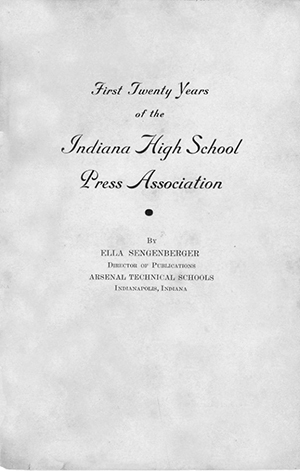 This page is dedicated to the rich history of the Indiana High School Press Association since its inception in 1922. Fortunately, the strong leadership over the years means there are lots of convention programs, newspapers and even special publications commemorating special 25th, 50th and 75th birthdays of this special organization. We will continue to add content to this page and encourage advisers to contribute mementos to this page. Click here to see a special calendar commemorating the IHSPA’s 75th birthday. Note: This may take a few additional seconds to load. Click here to see how two Franklin College students founded the IHSPA in 1922 and how, 75 years later, that same organization would use a generous endowment from Eugene Pulliam to grow into one of the strongest scholastic journalism organizations in the country. 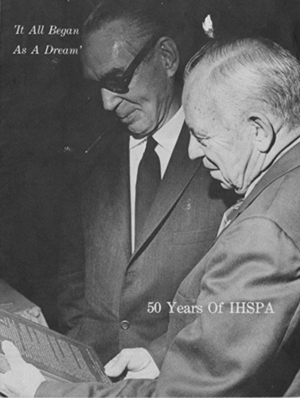 Stories from Harvey Jacobs, Diana Hadley, Norma Thiele, Jim Ray, Louis Ingelhart and others paint a vivid picture of the IHSPA’s rich history and goals for the future. In 1922, Franklin College editors Raymond Blackwell and William Bridges looked for ways to help communicate journalistic opportunities to high schools. On Oct. 28, 1922, that search resulted in the state’s first journalism convention that attracted 200 students. Fifty years later, the IHSPA had grown into one of the strong scholastic press organizations in the country. 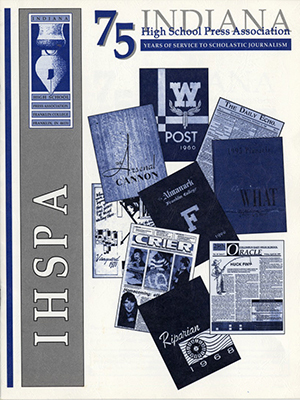 Click here to see a magazine dedicated to how the IHSPA thrived in its first five decades. Ella Sengenberger, Arsenal Tech adviser and the first president of the IHSPA, wrote the first history of the organization. Titled “The First 20 Years,” Sengenberger documented early conventions including the new “Advisers Division” that formed in 1932. Up until that time, the IHSPA was comprised of a Student Division only. You can read this fascinating and highly detailed account of the first two decades of the organization at this link: First 20 Years. In 1961, Vernice Irish, Historian, wrote “The Second 20 Years,” highlighting IHSPA activities from 1941 through 1961. Read how the IHSPA had to use public transportation to get delegates to the convention during the war years because private transportation was limited. 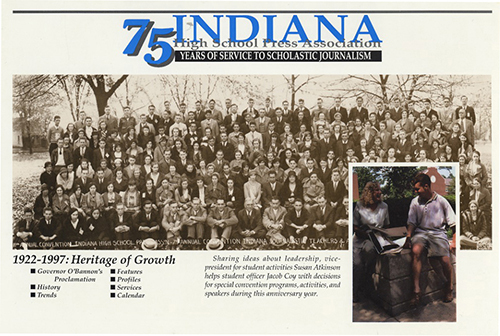 It was also during the second 20 years that the IHSPA played a major role in shaping state requirements for Indiana journalism teachers and also wrote a “Code of Ethics.” Finally, see a special review of the 1987-88 school year, a period of history that saw IHSPA’s first full-time executive director. It was also a time when the Supreme Court handed down the Hazelwood ruling and changed the landscape of scholastic journalism for generations. 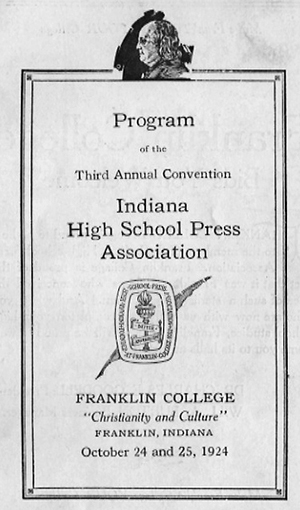 The Third Annual Convention of the IHSPA took place on the Franklin College campus on Oct. 24-25, 1924. In those days, the convention began on Friday and ended with an FC football game on Saturday afternoon. 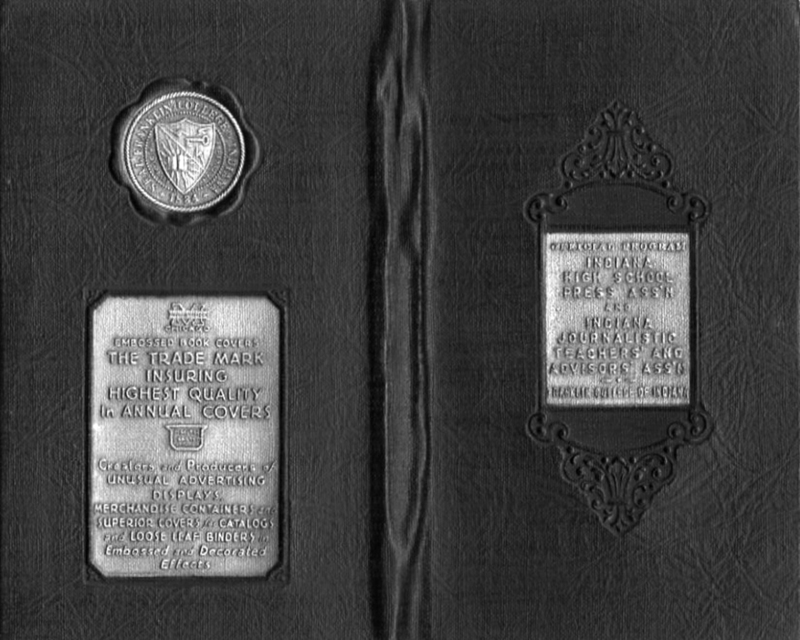 R. E. Blackwell is listed in the program as the “executive secretary.” Blackwell was one of two FC students who founded the IHSPA. The “adviser division” was not added until later. The first convention in 1922 drew more than 250 students. The 15th annual convention convened for three days in 1936 as students participated in workshops and writing contests while advisers conducted business meetings and even had “tea” at the Phi Delta Theta house. The convention concluded with Stephen C. Noland, editor of the Indianapolis News, who titled his remarks, “The Future of Journalism.” Click HERE or on the image below to see the complete convention program. In 1898, Shortridge High School established a daily newspaper,The Shortridge Daily Echo. 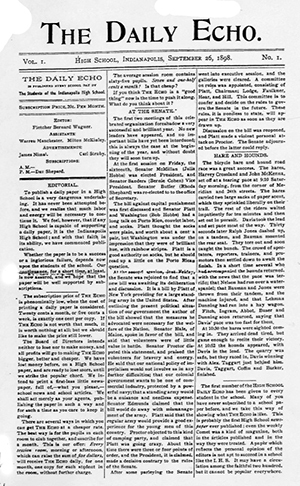 It was the first daily high-school newspaper in the entire country. It continued its daily status until the 1970s, when it was converted to a weekly publication. Kurt Vonnegut, Jr., and Donald Ring Mellett are two notable alumni who served as editors of the Echo. The paper won many awards over the years. In its final year, the necessarily-brief Echo was still able to win a second place overall award by the Columbia University Scholastic Press Association. Michael N. Selby and Edie Cassell were the last co-editors-in-chief, and Chris Keys was the last sports editor of the Shortridge Weekly Echo when it ceased publication with the school’s closure in 1981. However, this was not the Echo‘s last call. When Shortridge was re-opened as a Magnet High School in 2009, students brought back the Echo as well, published weekly.